Red Dead Redemption 2 (PlayStation 4) Review - What Kind of Man Are You? It’s 1899, and the American West is slowly being encroached by civilization. The wide open plains, forested mountains, and claustrophobic bayous are giving way to industry and law, a change that not everyone is content with. It’s a scenario that was originally presented in Rockstar’s Red Dead Redemption, and they dive into the same territory with Red Dead Redemption 2. And in doing so, Rockstar sets a new bar for open world games, both in terms of scope, detail, and storytelling. It is nothing short of magnificent. 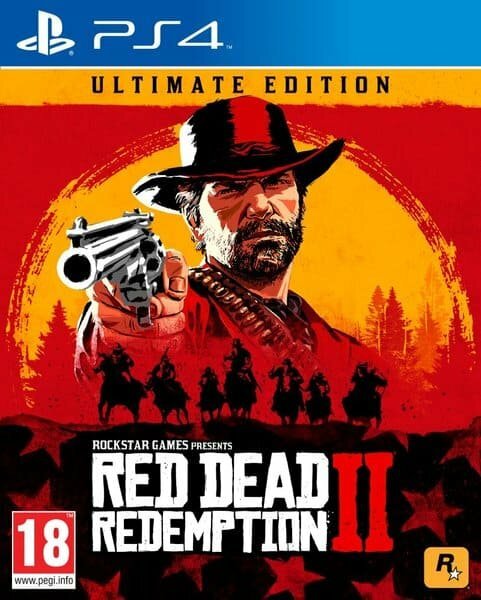 Red Dead Redemption 2 follows Arthur Morgan, a senior member and enforcer of the Van der Linde gang who is just trying to do what’s right for the gang. 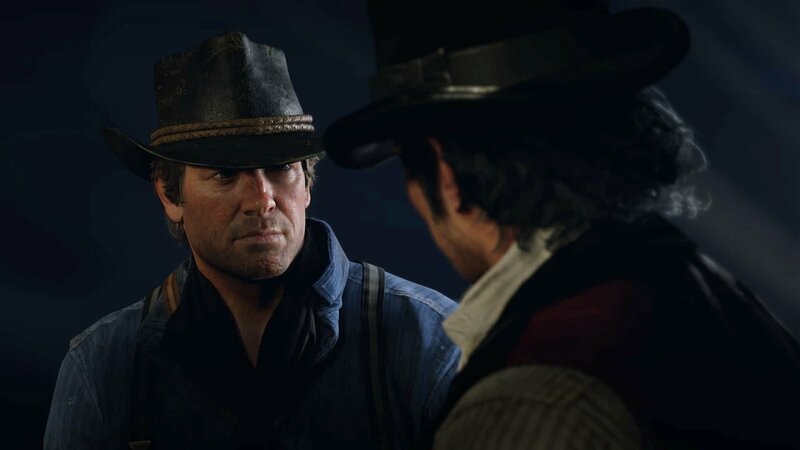 He looks out for the people he calls his friends, is vicious to those who oppose them and is ultimately bound to his own code that was embedded into him by the gang’s leader and Morgan’s father figure, Dutch Van der Linde. Yet as the gang flees across America after a robbery gone bad, Morgan must contend with not only the rival gangs, lawmen, and bounty hunters who are chasing after them but with the personalities and conflicts within the group itself. Morgan’s arc is fascinating, primarily because it doesn’t revolve around a clear-cut goal like searching for a family. He is in the gang because they’re his family, warts and all, and his attempts to break free of it have always ended in failure because he cannot be anything other than an outlaw. The core conflict for Morgan lies in one question – can a man who has killed and robbed countless people change? In a much-welcomed feature, you do have some measure of control over that answer, as your decisions will affect the game itself, ranging from story missions to the weather, to even the score itself. And it is with that mechanic that Morgan does not fall into the trap of being a yes-man protagonist, creating a character who is far more memorable than past Rockstar heroes. The Van der Linde gang itself also boasts one of the most compelling casts I’ve seen in a game of this scope. That’s not to say that they are all that likable, but that they are compelling and well written from top to bottom. Its twenty some odd members, and the relationships they have with each other form the backdrop of the game as you work with them to rob stagecoaches or plan reprisals against rival gangs. You’ll likely gravitate towards certain members more than others, which in my case included the Irish debutante Molly O’Shea and the quiet and competent Charles Smith. 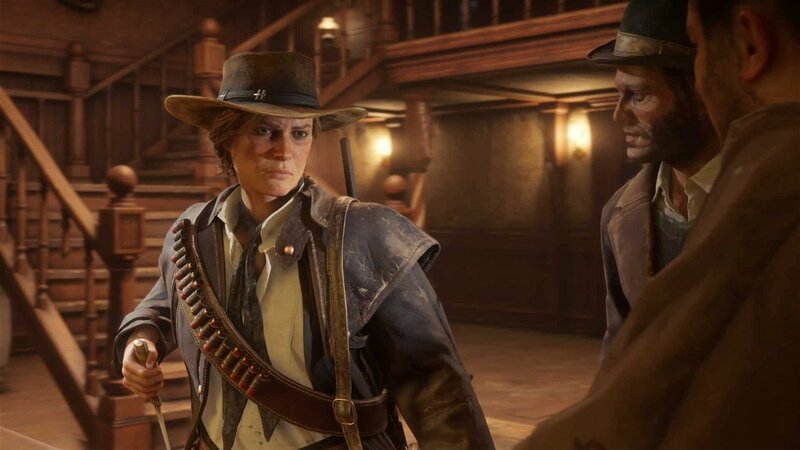 What’s more, unlike the first Red Dead Redemption, facial animations are used to great effect to convey each character’s personality in ways that result in some conversations where the message is conveyed through a narrowing of the eyes or a twitch of a nose. The game mechanics are also oriented to encourage you to interact with your gang. You can routinely go out and hunt for food to feed the gang, donate money with which you can upgrade camp facilities, and talk to the disparate members to get their take on the current situation. All of this is completely optional, but it does affect the mood of the camp and how other people treat Morgan. This, in turn, leads into side missions where you can work with a fellow gang member to, for example, rob a house or hunt for bison. These missions also provide greater insight into the motivations and personalities of the characters, and also provide some of the most memorable moments in the game. I never would have expected a naked man swimming to interrupt a day of fishing, but it did make fishing all the more fun in the end. 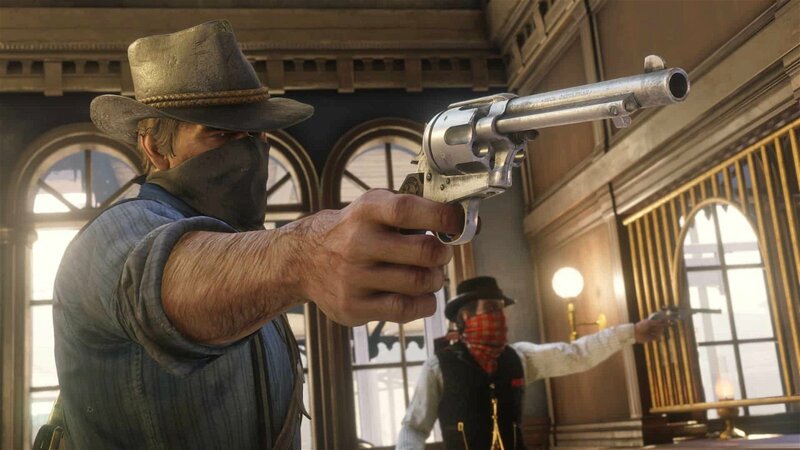 On a broader scale, Rockstar dives and explores a host of turn of the century issues with a surprising amount of grace. As the Van der Linde gang flees across America, it becomes entangled with such societal forces as the Lost Cause of the Confederacy and the removal of Native Americans from their lands. Some of these issues are explored in the story itself, while others are relegated to optional activities you stumble across, but in either case, the game handles the subjects deftly, grounding the entire game. 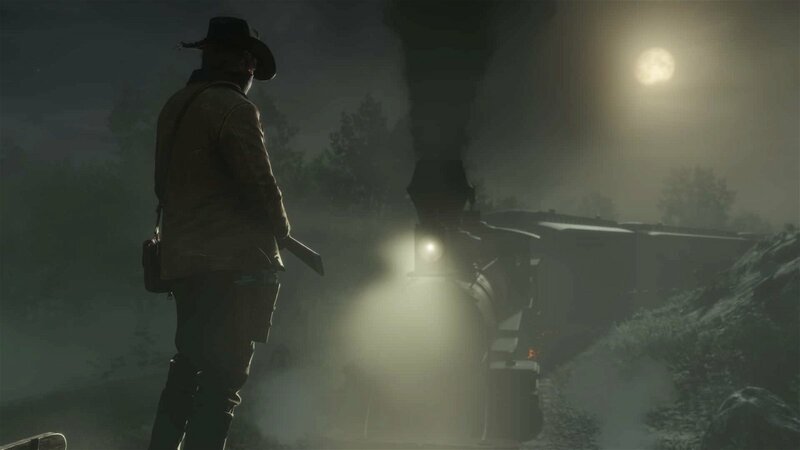 As Red Dead Redemption 2 is a prequel, those who have played its predecessor know what the ultimate fate of the Van der Linde gang is. Even without the knowledge of what comes next, the story is undercut by ever-growing tensions that never fade away even when there are sparks of hope. It simmers in the background, not always present, but always felt. And considering the main storyline takes anywhere between fifty and seventy hours to complete, that means there is plenty of time to use that tension to build towards what is a satisfying conclusion. Yet while the slow burn of the main story works well, it does stumble in the final stretch by spending a bit too much time in the final act. Several missions towards the end don’t feel like they have a purpose in the grand scheme of things, which shakes up the pacing to the point that I was grateful when the overarching plot finally kicked back into high gear. It is only a small portion of the entire game, but it arrives at a key juncture that affects the experience as a whole. Arguably the true star of the game lies in Red Dead Redemption 2’s depiction of the American West. Even though I have explored its boundaries and know its limits, it feels boundless and unending as the rolling plains give way to snow-capped mountains, and the vast deserts contrast with the industrious city of Saint-Denis. Make no mistake, this is a far more diverse game in its environments, and special mention must go to the aforementioned city, which fits perfectly in with the rest of the wilderness that surrounds it. No matter where you are, whether it’s by a campfire at the mouth of a cave or the top of a rock formation in the mountains, the view is often breathtaking. The details of the West, from the way that moss grows on tall evergreen trees to the way that a swamp seems to be teeming with life on the edge of your vision, are impressive to look at. I always looked forward to finding out what was over the next bend, and what people I would meet when I got there. Technically beautiful it may be, it pales in comparison to how alive the world feels. It always feels like something is happening in the world, even it’s not a designated side activity like poker or dominos. Official missions with strangers dot the map, but just by riding the road you can encounter such events as a woman whose horse suddenly died and needs a ride or an attempted robbery outside a general store. Or, in my most memorable encounter, stumbling across the Ku Klux Klan in the middle of a Southern forest at night as they were about to stage a cross burning. Red Dead Redemption 2 encourages you to wander, rewarding exploration with a system that always has something new and exciting to offer those who care to look. The sheer number and variety of activities are ridiculous at times – there are mechanics in place if you want to shovel manure, there are challenges through which you unlock special gear, and there are hundreds of animals, plants, and weapons that you can discover to mark down in your compendium. The activities extend to the improvement of Morgan himself. He will gain or lose weight depending on your diet, which will make you quicker and weaker if you’re underweight or slower but heartier if you’re overweight. Running, taking part in physical activities, and pulling off tricky shots will increase your stamina, health, and Dead Eye respectively. These mechanics integrate with others, such as fishing with a friend to improve both your relationship with them and your strength, creating a reward cycle that continually affects you and the world at large. Key to any Western, but particularly key to Red Dead Redemption 2, are the horses. 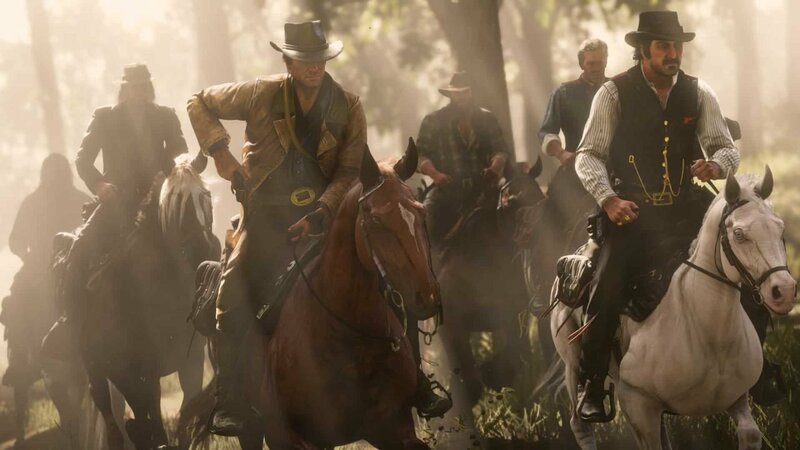 Rockstar has made a number of changes to horses in this prequel, the biggest of which is that your horse is an individual animal that cannot be spawned forever should it die. That means you have to be careful when riding it, always making sure that you have enough food to recover its stats and that you are appropriately bonding with it to improve them. The result is that your horse feels special, as you’re given the option to name it, change its mane, and buy specific equipment for it. This also makes the death of a horse all the much more impactful, as it’s one that you devoted hours to so that it could grow. I was distraught when one of my horses was eaten by an alligator in a swamp after a nasty tumble, and it’s to Rockstars credit that the bond with your horse becomes one of the most important relationships in the game. These systems are helped by how slow the game feels from moment to moment. Whether it’s a result of the distances you cover or the speed of the horses, it takes plenty of time to travel across the world. That’s not a complaint, as the slower pace forces you to take in your surroundings and pay attention to what’s going on. This also extends to many activities as well, as hunting rewards you for patiently tracking and using the appropriate tools to get that perfect skin, while others require you to tap or move the joysticks at a deliberate pace to get the job done. 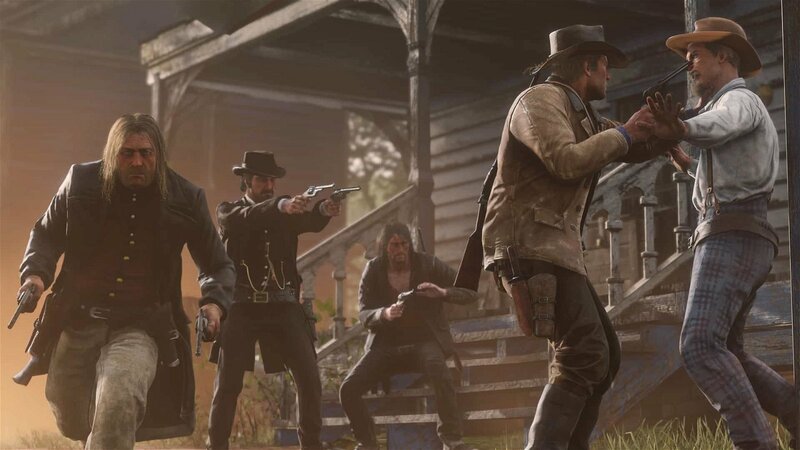 Red Dead Redemption 2 emphasizes taking your part, and you will get more enjoyment out of the game that way than if you rushed in headlong. What isn’t slow is the gunplay, which is deadly and requires quick shooting if you want to make it out alive. Dead Eye returns with several upgraded features that are unlocked as you improve the skill, making it a much more useful and much cheaper way to cut through hordes of enemies. Even without it, it’s remarkably easy to gun down a half dozen men without any trouble, and cover is often not required as you stand still and patiently cut through man after man, and the game is rarely challenging as a result. Red Dead Redemption 2 also handles well, though moving in enclosed or tight spaces can get a bit tricky as both Morgan and his horses like to take longer turns than is necessary. There are a large number of context-sensitive inputs as well, which could cause trouble if you aren’t paying attention to whether or not you have a weapon equipped. By and large, however, the controls are straightforward and easy to learn. Just like any Rockstar game, Red Dead Redemption 2 comes with its fair share of bugs and glitches, though fortunately I only noticed a few that really impacted my time with it. At one point, the game was stuck on a loading screen for over five minutes, before I had to close the game and restart it to get things moving again. Other glitches were mostly harmless, but noticeable nonetheless, as corpses merged with living characters and Morgan moving extremely fast when in the special kill screen.